Here are the three Hoenn starters. Some of them need redoing, but they're still okay. You made them for AncientEmerald, right? Nevertheless they seem to be done for 1st gen, more than for 2nd, since they have just one color (Mudkip,especially, compared to the one Mateo posted). Anyway, they're nice, good job. No, I like that sprite, just remove the lighter shade of green and put white in the place of it, and then it's perfect! leafeon still looks pretty cool :D and yeah i will make it better some point, where i live it is now 22:57 and im tired, so im not going to make any work yet as i may ruin something. Pallete: Green comes from Victreebel and Red from Croconaw. Well, I'm gonna start devamping some 5th Generation Pokémon/Sprites of older Pokémon. I may do Zoroa's sprite next. I'm thinking about doing Sazandra's sprite next, or Zuruzukin's line. Gray-like color came from Donphan. Thank you. Yeah, I really took advantage of making more white and black dots to give the Illusion of more colors. Especially since Zuruzukin has a lot of colors that could be worked into a GSC devamp. I'll make some more Isshu devamps soon. I abused the white and black dots again to make it look more advanced than it really is. I also got rid of two arms and shrunk it, but I think if fits for a Pokémon that's supposed to be odd in the first place. Light Blue comes from Suicune. So just to confirm, GSC sprites are either 48x48 or 56x56 pixels, depending on the size of the pokemon and consist of two colors plus black and white, right? I was just wondering because Mateo said he'd shrunk Mudkip to fit 40x40 pixels and most of everything else I'd read said 48x48. 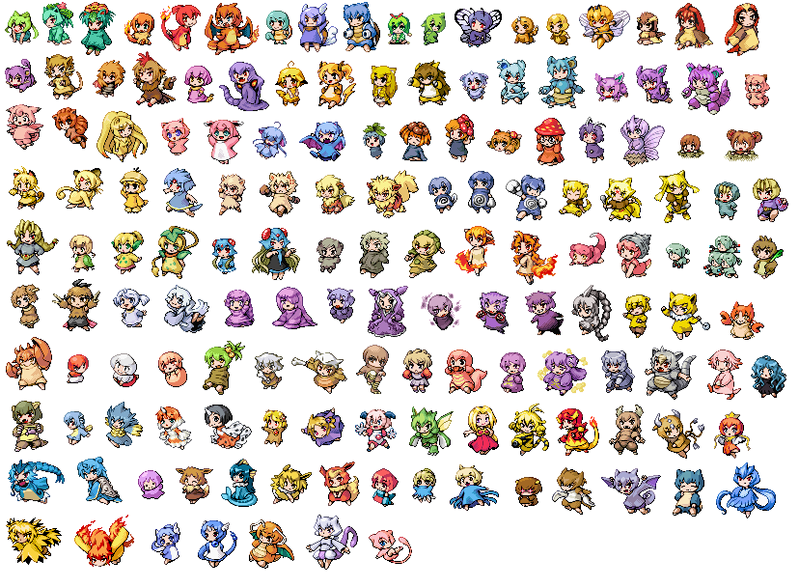 And also, do the colors have to be taken from existing GSC sprites or can someone upload a palette which has all of the GBC compatible colors? I know you can use AgiXP to extract or insert sprites, but can you insert a 56x56 pixel sprite over the sprite of a pokemon that is 48x48 pixels? Or does that pokemon's sprite data need to have more memory allocated to it to accommodate for the larger sprite or something? 40×40 is also a valid size. and consist of two colors plus black and white, right? Some programs automatically repoint; I've never used Agixp so I don't know if it's one of them. By that do you mean that specifically 40x40 is a valid size or is anything within 56x56 acceptable? Also could you give me a link to, or a name for, a inserter that you can confirm does automatic repointing? I'm not too familiar with hex yet, you see. As far as I know, the size has to be square. 40x40, 48x48, and 56x56 are the accepted sizes. Agixp does repoint automatically, it will by default find free space on its own, or you may manually specify a location to insert it if you prefer. To insert a 56x56 over a 48x48, you will have to go into the pokemon's stats and edit the byte for his picture size, so the game knows to load a 56x56 instead of a 48x48. Orrr you could do it the easier way, most evolution families of 3 (bulbasaur, ivysaur, venasuar) goes mainly, 40x40, 48x48, 48x48, but there are odd occasions where the game wanted the sprites to be bigger to give a more powerful feel, aka 56x56, i use AgiXp to look what size of the pokémon i want to replace first before devamping my sprite, hope i helped. Re-done my celebi sprite, this time i have used the correct amount of colours, you can check it, the pallette is from the D/P celebi sprite. Right i got an idea, for the younger generation of hackers, who want to make a good pokémon hack and add there own feel to it (fakémon) why don't we all make evolutions of fakémon ? E.g, a family of 3 to replace bulbasaur, ivysaur and venasaur...charmander....you get what i meen, if we all contribute at least one fakémon in a 3 evolution, another member could do the next evolution upwards, or a member could see somebody else fakémon and improve it a little bit...good idea or not ?? You could as well for example replace Bulbasaur with Fakemon no. #1 and Grimer with Fakemon no. #2. Then you just make it so that Bulbasaur evolves into Grimer and Grimer can't evolve anymore. * Off topic: Does anyone know how to insert changed sprites (.png files) into Yellow? I changed the color of few backsprites and front sprites but I want to know how to get it in the game. Currently no automated way to do it. You will have to convert the PNG to Game Boy format, then either compress it manually or rewrite Pokémon Yellow’s code to allow uncompressed images (which has been done before by a few people). I've made from Snivy up to Gigalith,including their backsprites and shinies,but I will show only the last stages of Unova starters. Cool. That's just great how you can make that GIANT pokemon into 56x56 pixel. Great! haha,coz im planing and starting to make a gold hack which includes mostly of 5th and 4th gen, some from 3rd 2nd and 1st. And i need some members. I'm a Filipino. Sorry if its off topic or spam.. I will post some sprites later or sometimes.